Due to popular demand (and despite the fact that this thing hasn't been updated in forever) the ULTIMATE EVA FREQUENLTY ASKED QUESTIONS - FAQs - is back online! Just in time for EVA's 10th Anniversary! 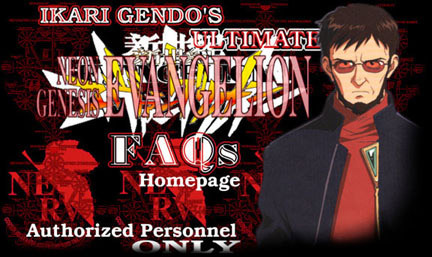 Welcome to my Ultimate Evangelion FAQs Page, online since 8/17/1997 . My name is Ikari Gendo. If you are a member of NERV personnel who wants to know everything that there is to know about the show and movies that I star in (aka Shin Seiki Evangelion), please enter by clicking below. If you are a member of SEELE, or you have recently tried to kill me, click here. Have a nice trip either way. I am warning you now. There are answers to questions that are raised during the later episodes and the movies that contain major spoilers along with many pictures that other sites just don't have. I do not answer these questions and display these pictures to ruin the series for the masses that have yet to see them, but only for the clarification of the minds of those individuals fortunate enough to witness the events leading up to the Third Impact. I may have said too much already.